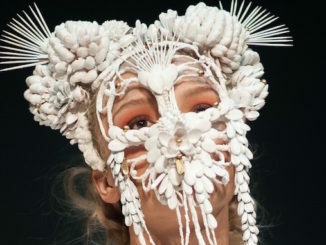 For over ten years, Fashion Art Toronto |FAT| has showcased and promoted Canada’s best emerging designers. But after the lights had dimmed, fashion fans were left wondering, “Where can I get that?”. Most major retailers overlook local artists, preferring the cheap, fast fashion and profits from large scale manufacturers. This year, |FAT|’s creative director, Vanja Vasic, has answered the call for local style with Off-Site. A hybrid coffee shop, art gallery, collaborative space, and clothing store; Vasic’s new space re-visions retail, and acts as an extension of the week long fashion festival. In partnership with Calder Ross, a furniture and interior designer, and curator Siya Chen, Off-Site is an intimidating space at first glance. Ross designed and built the modular furniture from wood reclaimed from houses around the city. All the furniture has been designed to be multi-purpose to accommodate the use of the store as an event space, or collaborative studio. Plants in ultra-chic planters become sculptures worthy of MOCCA, and clothes are displayed minimally, à la Mink Mile. The prices are surprising, however. Unlike the Bloor street boutiques, prices range from a sweet $60.00 for a pullover, to $350.00 for a dress – not too shabby for luxury fabrics and master tailoring. These are the kind of pieces to build a wardrobe foundation – quality work that will withstand trends and remain integral to your personal style for years to come. Like |FAT|, Off-Site will exhibit collections based on a theme, which will change bi-monthly, showcasing work from Vasic’s impressive stable of designers and artists. This month’s theme is New Minimalists; fashion photography, jewellry, and garments by designers like Brit Watcher reflect that with cool, clean lines and a stark colour palette. In addition to the exhibition space, Off-Site is designed to be flexible to accommodate different needs – open to photographers for studio shoots, or meetings of design teams. The Café is filled with creatives working away on their laptops – fleeing the isolation of working alone at home. 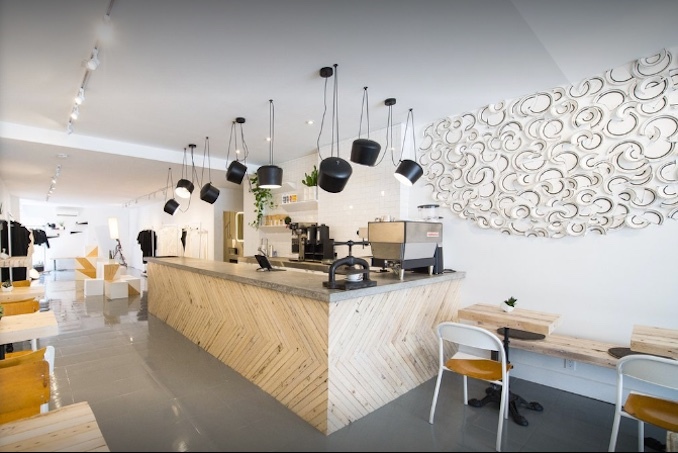 While other coffee shops have signs limiting the amount of time patrons can work at tables, Off-Site is designed as a communal office/studio space. Off-Site officially launches with a party Friday, September 23 at 8:00, and is located at 867 Dundas Street West.